At first, I didn’t think I wanted to do #Bloganization. Going through my blog’s archives seemed too daunting a task–even for a month-long project. My archives are an assortment of the last four years of my story, and that story has been through a good share of different chapters: my pen name’s been dropped, my blog’s name has changed a handful of times, I’ve had the look redesigned. And don’t even get me started on how my blogging style has evolved! But all the reasons organizing my blog’s archives felt overwhelming were the very reasons I considered dong it. So I decided to take the plunge into #Bloganization. That evening, I took the first step into moving backwards through my blog archives. I went category by category, because that provided more short-term goals to celebrate (yeah for three whole categories sifted!). I read early posts smiling and cringing. Unattributed pictures I trashed. Broken links I fixed. And what did I find that surprised me? A lot of posts in my archives that I could now freely deem irrelevant–for various reasons, most relating to style. Gretchen’s Top 10 Questions to Help Organize Your Blog Archives helped me define what irrelevant content is: irrelevant content consists of those posts that no longer belong on your blog for whatever reason. Irrelevant posts might include outdated information, views you have since changed, or topics that no longer fit your unique brand. 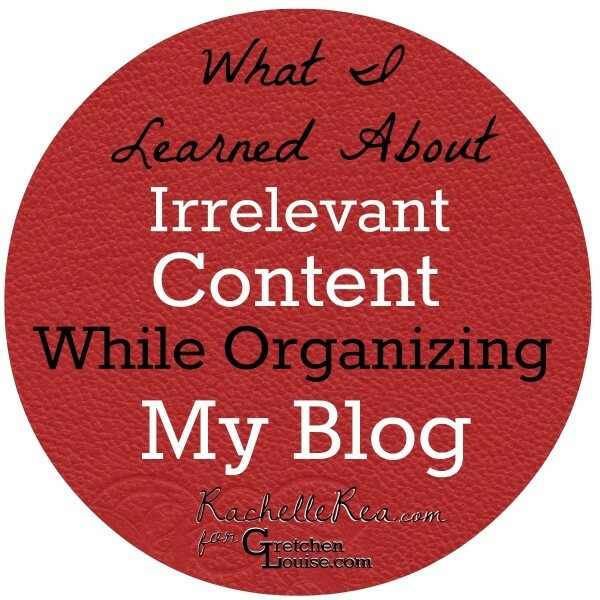 Here are three things I learned about irrelevant content while organizing my blog. I had tons of posts comprised of nothing but short announcements of guest posts I had published, yet only a few of the more recent posts got any real hits. Because I was doing #Bloganization methodically and over a month’s time, I was able to analyze what announcement posts were popular and what posts weren’t. The answer? Posts where I simply said I’m talking about such-and-such over at so-and-so today didn’t really go anywhere. 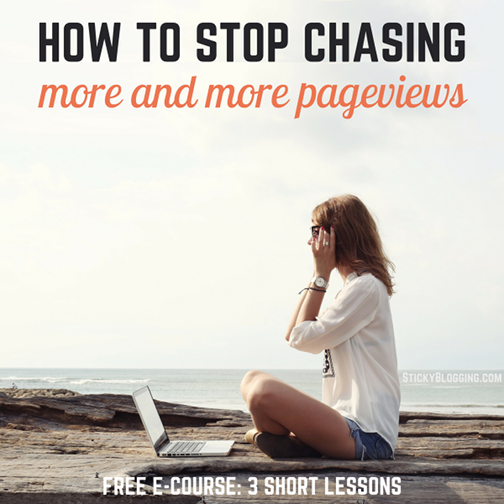 Posts that began with a story and led to a link to a guest post were much more popular. I already knew the “fact” that posts with a story were well-loved by readers, but seeing the truth of it in my stats drove the point home. Now I feel like I have more freedom to unleash the storyteller in me. 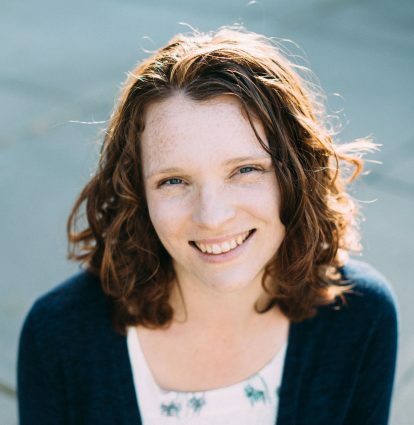 I was an eighteen-year-old homeschool grad when I started blogging, and now I’m a twenty-two-year-old college grad. A lot of maturity has happened, people. I no longer post rambling stories and bad poetry; I’ve long since surrendered the idea of becoming a poet, yet those poetry posts were still on my blog. I fixed that by moving them all to a Word document to sort through later when I might want to turn them into…something. Because I was doing #Bloganization, I was able to give myself permission to archive those words elsewhere. Just because I’m a blogger doesn’t mean I have to blog every word I write. When I began blogging, I was an inexperienced blogger. That’s how it works; we all begin that way. I’m not the most efficient blogger even now, but I’m definitely more experienced than when I began. I used to post about Kindle freebies, online Bible/book study invitations, new blogs I had found and followed. Now I know that links to free Kindle books should be shared in Tweets and this Facebook group, not blog posts. I know that online study invites are better emailed to friends who may be interested. So I did something that felt crazy the first, tenth, and hundredth time: I deleted posts. I deleted over 150 posts, actually. And guess what? My computer didn’t blow up; the world didn’t end for missing words no one read. It felt freeing (and humbling) to unclog the archives in that way. Now I have a much leaner, cleaner blog, and I learned a lot in the process. With a better handle on how I blog, I’m looking forward to the next four years of my blog’s life. Did you participate in #Bloganization? How much irrelevant content did you discover? Does your blog need some #bloganization? Going through my archives is something I’ve been saying I’ll do for months….but I never get around to it because it seems so overwhelming! Thanks for the encouraging post. I just may have to tackle one this month! Thanks, Kalyn! Do let us know how it goes! I did bloginization, too! Well, I did one year’s worth of archives. I’d love to go deeper sometime, but that was the goal for this season, and I was able to complete it. I really love how you let your old ways of blogging inspire future content. That was probably the best thing to come out of my dive into my archives–inspiration and direction for future posts. I found posts that needed sequels, and stories that I had another chapter to add to. I say, if you are ever stuck on what to blog about next, definitely look back to your archives! I really need to do this and like Trina’s idea of one year at a time. I may break it down even more and do 6 months at a time. Maybe even three. I get so overwhelmed so easily! I guess all we can really do is one post at a time. So maybe I can look at at least 2-3 posts a day, right? Okay, that’s doable! Thank you, Rachelle! 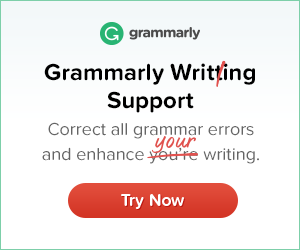 I’m so glad you were willing to write this post, and that you were inspired to join #bloganization in the first place! I got a good start but I certainly didn’t get all the way through my archives. I know it will be an ongoing process, but now I know how doable it really is. It just takes time and a goal I can accomplish.